Our theme for the month, Rebellion, has many different meanings and contexts to different people. To some, it’s a state of mind, hyped and excited by the music and art of an angry generation. Others see it in a more practical light. How are rebellions structured? What happens when you win or lose? Who will make up the rules? When we discuss rebellion, we often think of riots and looting, but resistance can be non-violent. Our minds are currently stuck on the political climate, but not all rebellion is rooted in politics. Children rebel in strange ways as a part of growing up. Adults rebel against their nature. In this issue we explore these themes and attempt to answer a few questions, but as with all things, we end up with more than we started. If you are intrigued by the excerpts, please consider purchasing the issue or subscribing. You support pays our writers a fair wage and keeps Unwinnable afloat. Gavin Craig has a lot of games on his shelf that he’s never played. Backlog is his attempt to correct that. I never beat Super Mario Bros., but after hours of exploring and random monster encounters, I defeated the Dragonlord and brought peace to Alefgard. Final Fantasy seemed even deeper and richer than the first Dragon Warrior game, with mages and monks, elves and witches, pirates and sea monsters, but I never completed Final Fantasy on the NES. I didn’t even make it to the point, so enticingly hinted at in Nintendo Power magazine, where my monk would become a ninja, my warrior a knight and my mages wizards. I think I got as far as obtaining the canoe, but I’m not entirely sure. This summer, when my brother and I got together to try and reconstruct on paper our old collection of NES games, we couldn’t even agree on whether we had owned Final Fantasy or not. Every week Megan Condis and a group of friends get together for Documentary Sunday, a chance to dive into the weird, the wacky, the hilarious and the heartbreaking corners of our culture. This column chronicles all of the must-watch documentary films available for streaming. Sour Grapes is the story of Rudy Kurniawan, a major player in the world of wine who went to prison for crafting counterfeit bottles in his kitchen in 2013. Directors Jerry Rothwell and Reuben Atlas are careful to spotlight the 2008 recession occurring in the background of Kurniawan’s epic con job, making it difficult for viewers to feel anything but contempt for his victims (which included the likes of one of the billionaire right wing Republican Koch brothers). In fact, the film suggests that, in a perverse way, Kurniawan actually understands the commodity for sale at these auctions better than the vintners, the sommeliers and the collectors ever did. Kurniawan sold an experience, an illusion of exclusivity, and, in the end, a scapegoat (himself) to punish for daring to mock their little club. Your best source for what’s new, undiscovered and unholy in metal. Black Anvil’s revelatory 2014 Hail Death signaled a new direction for black metal. Three years later, As Was finds the proud torchbearers of New York Black Metal re-articulating the extremities of black traditions even further. Doing for the black what Kvelertak did for blast and classic metal, As Was intermingles haunting clean vocals with feral screams and elements of gothic, hard rock and classic metal. Combined with booming production reminiscent of a live show (that bass! ), As Was pioneers a new brutal shade of black that is more modern and accessible than almost anything that’s come before it. High points include the opener, “On Forgotten Ways”, “Nothing” and closer “Ultra”, but it’s tracks like the stunning “Two Keys: Here’s the Lock” that legitimizes As Was as an evolutionary force within metal, and establishes Black Anvil as the vanguard of the new black. Flowers arching up brachial trees, petals buildings up in the lungs and filling up the windpipe until the sufferer dies. They choke to death on the signs of their affection, bloody flower petals on their lips. It’s called Hanahaki Disease, and it’s a fanfiction trope about unrequited, one-sided love. Corey Milne stands at the intersection of gaming and world history to see what he can see. Poor old BJ Blazkowicz. His loss is the world’s. He fails to kill a particular Nazi, slips into a coma and finds the world in the thrall of full blown Nazism. Even when he’s fought his way through the fascist hordes and taken his revenge, we are still left with our enemies in power. Very little in the grand scheme of things has changed. We’re still losers. A tongue-in-cheek but also painfully earnest look at pop culture, politics, music, videogames, travel, fatherhood and anything else that deserves to be ridiculed mercilessly while at the same time regarded with the utmost respect and sobriety. It is written by Matt Marrone and emailed to Stu Horvath, who adds any typos or factual errors that might appear within. Someone pointed out at work that the 1973 film Westworld, starring Yul Brynner, would be airing on the SyFy Network. I set my DVR. I’m a fan of the HBO remake, so I was curious. I suspected seventies camp, but as the film was written and directed by Michael Crichton, I was excited to view it through my usual prism of hipster irony mixed with earnest love. I wasn’t disappointed on either front. But I’m not here to write a movie review. You should DVR it for yourself. Instead, what I want to propose to you, dear reader, is a not-so simple question: Which World would you go to? A monthly glimpse into whatever gaming bugaboo Rob’s got on his mind. I can never decide how to feel when the topic of eSports and competitive gaming comes up. I hate how some people scoff at the idea of videogames being taken seriously, but I also can’t help rolling my eyes at just how overblown and cartoony these events tend to be — most likely out of being desperate to be taken seriously. Hell, the other day I caught some of an episode of CSI New York that involved a Big Video Game Competition (obviously sponsored by Microsoft what with all the Gears of War 3 fellating) and I wanted to be mad at the ridiculous depiction of Professional Video Games, but I couldn’t because they do get that absurd. Here’s the thing: despite the love or hate any of us might have for pro gaming or whatever you want to call it, it’s going to be sticking around for a while. Not only have the venues been getting bigger (and more crowded), but it’s begun to take hold of mobile platforms as well. Adam examines the reasons why he and pop culture consensus differ in opinion. In May of 1942, Stjepan Filipovi?, a member of the anti-fascist Yugoslav Partisans, was hanged by the Nazi-aligned Serbian State Guard in the town of Valjevo. Just before his hanging, he shouted, “Smrt fašizmu, sloboda narodu!” — “Death to fascism, freedom to the people!”, a communist slogan that Filipovi?’s execution lent further poignancy and urgency. The phrase’s popularity has persisted in the years since the end of World War II and the latter half of the phrase — “sloboda narodu” — appears as both the title and last words heard on the first track of The Radio Dept.’s 2016 album, Running Out of Love. It reflects the anti-fascist impulse that drives the entire record, an album that best captured the mix of fury, frustration and despair I felt throughout 2016 as I witnessed the seemingly inevitable (but entirely preventable) rise of authoritarian nationalism in the US and elsewhere. A repository for games and ennui. A few months [after my father died], Fallout 4 was released. The setting for the game is Boston and has quite a few Boston landmarks and city flavor. I explored the city and looked for places I visited with my dad. It was nice and nostalgic, but we never spent much time in Boston together. Then Bethesda announced the upcoming downloadable content for the game. Among the titles, one stood out – Far Harbor. In the game, Nick Valentine gets a case about a missing person in Far Harbor and you take a boat up to Maine to solve the case. At first, I was pretty excited about the thought. I’ve actually been to Bar Harbor, which Bethesda has said this DLC is based on, and I know what it’s like. It’s also supposed to be the largest DLC Bethesda has ever made, which is also exciting. I’m not sure if I can play it. It was 10:41 PM on a Friday night. Many kids my age were either out that evening or otherwise being told to keep the noise down. This was not the case for my friends and me. We planted our butts firmly in my living room and were trying as hard as we could to not make a sound while the speakers on the family television faintly whispered to us. I’d love to tell you that we kept the noise down so that we wouldn’t disturb my parents, who worked hard the whole week for the opportunity to sleep in a little bit on a Friday night. That’s not the case. The volume was low because the entertainment was low. Our feature presentation that evening was the 1992 “classic” Dr. Giggles; a grotesque entrant into the slasher genre starring Larry Drake as a crazed doctor out for revenge. As time goes by over multiple playthroughs, you begin to understand that FTL’s rebels are hateful, racist, fascistic, and inexplicably wealthy, in defiance of the usual tropes. Maybe it’s your tenth or eleventh playthrough when you realize that the Rebel ships in FTL are only ever crewed by human soldiers. Maybe you finally run into the Unarmed Zoltan Transport vignette and meet the Rebels who yell at you for impeding human progress by working with aliens. Almost everywhere you go, the Rebels are preying on the civilian population, and the aliens and civilians who join you on your mission always believe the Rebellion is the evil party, and stands in the way of peace. The symbol of the Rebellion is an eagle, wings spread in a posture reminiscent of the Reichsadler. Despite the Rebels’ status as, you know, rebels, they are far better-equipped than the Federation and its allies. Much of the game is spent fleeing the rebel fleet, and if they catch up to you while you’re distracted looking for resources, they will destroy your ship in a heartbeat – nobody survives repeated contact with the advance guard of the rebel fleet. Their flagship is the most powerful single ship in the game, and has far more in common with the Death Star than the X-Wings and Nebulon-B Frigates of Star Wars’s Rebel Alliance. Whoever is funding FTL’s Rebels has a lot of money to spend, and the connections to build a titanic fleet. The people who voted for Donald Trump thought they were rebels. “Drain the swamp” is supposedly a rallying cry against the establishment. Milo Yiannopoulos rose to fame by making young white supremacists feel like members of an edgy counterculture. Obviously, none of this is true. Rebellion is opposition to an established, empowered ideology. There are few ideologies more established or empowered than racism. Despite the fact that the far right’s policies remain as regressively “establishment” as can be, the means by which they sell their policies has changed. Instead of preserving their place in society, the Far Right wants us to believe they’ve lost their place and must reclaim it. The “dapper young white nationalist” neo-nazis receiving attention buy into the pitch that, in a world where tolerance has run amok, their politics of hate are anti-establishment. A culture that grants too much advantage to “inferior” people has usurped their rightful place as society’s elite. When the “Alt-right” loudly espouses hate speech, they don’t see themselves as pathetic individuals more interested in protecting their personal power than moral decency; they’re revolutionaries standing up to the “powers that be.” In other words, the far right establishment has essentially appropriated the “brand” of rebellion. The word “rebel” does not refer to an identity or an inherent characteristic. It is a stance, an orientation directed toward a particular object. Rebels don’t act on behalf of a cause. They stand against something. They are the opposition. This makes rebellion a powerful rhetorical posture, one that, for better or worse, featured in many of 2016’s defining moments. As I’ve written about previously for Unwinnable, it is one of the defining characteristics of geek culture. We love to imagine ourselves as embattled underdogs pushing back against unjust social strictures and upending the corrupt institutions that are holding us back, both in the media we consume and in our everyday lives. We are the nerds, the outcasts, the iconoclasts! Rebel on! Yet rebellion isn’t always a good thing. The morality of a rebellion depends in large part on the structure it is facing off against and the presence of rebels does not necessarily mean that an unjust act of oppression is taking place. After all, no one likes to think of themselves as a small cog in a gigantic machine of repression. This means that the rhetoric of rebellion is an effective recruitment tool. It is important for all aspiring rebels to look past the rhetoric and really examine the issues at hand. Otherwise, their rebellions have the potential to transform into evil Empires. Yes, I’m going to make a Star Wars analogy. Stick with me here. It’s easy to see why people are gravitating towards the DA as their rebellion of choice, as well as the rebellions of the Hunger Games and Star Wars series. At its core, Dumbledore’s Army is ideologically pure. They are a bunch of children (they’re about 15 the year that DA is founded) fighting to teach themselves self-defense against the rising tide of war, learning in spite of an instructor who is fighting to keep them in the dark. In J. K. Rowling’s book series, the DA is perhaps the group that is most on the side of angels. Punk has probably always been a lie for me. You must be safely into your 30s declare such things, but I decidedly missed the point of everything. I wanted to care, in the way that middle school kids in central Kansas who don’t have real problems are anxious to take on the needs of others. I had a punk/ska band called The StereoType (yes, I know) where all the other members of the band had been much more involved in punk politics for much longer than I had, so when they took a stand on something, I took that stand too. This is how we came to play a local protest show against Taco Bell, for the wages they paid their tomato pickers in Mexico. To this day, I’m not sure there was ever an actual issue there. There was probably a blog post somewhere but it didn’t really matter. It felt important to think you were important. And that’s why I boycotted Taco Bell. That, and the fact I refused to eat tomatoes, so like . . . I’d never eaten there anyway. That didn’t matter either. I was changing things. The cyberpunk setting is a post-industrial dystopia, resembling the chaotic urban streetscape of East Asian countries like Hong Kong, China and, of course, Japan. 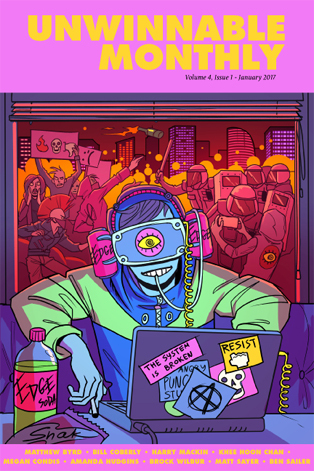 This is in no small part due to William Gibson’s influence; the godfather of cyberpunk once remarked that “modern Japan simply was cyberpunk.” Dwindling resources, environmental degradation and moral ambiguity are also staples of cyberpunk fiction. However, its central tenet is the density of data and the disastrous consequences of the abuse of information. This abuse that allowed megacorporations in fictional works to monopolize control over not just markets, but also countries and laws; omnipotent governments to monitor citizens’ every move in the guise of protecting them; and lifelike killer cyborgs to run amok amidst an endlessly neon cityscape. This careless abuse of information was what plagued 2016. It’s the year that data was dragged down a deserted alley, beaten to a pulp and left to die. That is most telling in how Oxford Dictionary has christened “post-truth” the word of the year: an adjective that denotes “circumstances in which objective facts are less influential in shaping public opinion that appeals to emotion and personal belief.” Consider Donald Trump, a man so far estranged from facts that he regularly espouses lies, like promising to make Mexico pay for the border wall and that global warming was a hoax fabricated by China. It doesn’t matter that he is not right – people already believe him. Videogames, as one of the most potent forms of escapism, are especially enamored with rebellion. From XCOM 2 to Homefront to Final Fantasy VII, stepping into the digital boots of the plucky underdog is even more compelling than watching their story unfold from the sidelines. Yet while the why of rebellion is different from game to game, the how is often disappointingly similar. Guerrilla warfare is the go-to tactic of the videogame rebel, violence seemingly the only weapon with which to fight the power. Whether it be slitting throats in Assassin’s Creed or leveling entire city blocks in inFamous: Second Son, the road to peace is paved with death and destruction. This trend paints a primitive and dangerous image of rebellion. Brute force isn’t the only way to effect change; in reality, it should always be the measure of last resort. Peaceful protest and non-violent resistance are just as capable of challenging established norms without coating the streets with blood. Revolutionaries like Rosa Parks, Martin Luther King Jr. and Cesar Chavez have shown us that societal problems require societal solutions, that lasting change is won with an army of hearts and minds rather than one of swords and spears. Videogames have ventured into historical themes before. Rarely, however, have they sought to tell complex political stories with a firm commitment to truth and accuracy. 1979 Revolution: Black Friday is a well-researched piece of work, incorporating real-world photographs and audio snippets to pull players into a true-to-life narrative. It is also careful to present events as they were; the aim is to inspire change by fostering understanding, rather than pushing propaganda. That’s exactly what one right-wing newspaper accused Khonsari and his team of producing, however, leading to iNK Studios’ virtual exile from their home country. Rather than halt work on the game, the company relocated to New York City. The urgency and drive required to pursue this project against the odds lends added weight to its experience, which relies on fast-moving scenes to maintain a sense of confusion (as being in the middle of a full-scale revolt might be), card-based explanatory backstory pieces and real-life photos and audio snippets to carry a complete narrative. When I first heard composer Michiru Yamane’s available music for Bloodstained – a yet-unreleased videogame helmed by Castlevania series ex-producer Koji Igarashi – all I could do was ask, “Does Yamane enjoy making music anymore?” Every piece sounded preemptively fatigued, as if its own material were a thing to get out of the way for duration’s sake. Why? This was Michiru Yamane, a woman whose earlier soundtracks were verdant musical landmarks. This was also the Michiru Yamane who left corporate employment ostensibly to go independent, and yet who hasn’t made much in the near-decade since. I could try to expand on a course of reasoning here: that, post-Konami, Yamane was content to release just one “From the composer of Symphony of the Night!” soundtrack in the form of Skullgirls, put out her first and only non-videogame album and be done with it all, aside from the sporadic contribution to others’ soundtracks; and that she’s only doing Bloodstained’s soundtrack because she didn’t want to dismay Igarashi, an old acquaintance, now that he was finally getting to do things on his own terms while trying to partly reassemble Symphony of the Night’s team. Instead of dwelling on these assumptions, though, as a composer myself, I’ve found greater resonance in thinking about how we emotionally invest in others’ creative works. If our only link to a person is their work, it’s especially easy to conflate the work with the person. There is a precedent for this, anyway, within the Western art canon: a painting by Kehinde Wiley or Joan Mitchell is not “a painting by Wiley” or “a painting by Mitchell;” it is “a Wiley” or “a Mitchell.” Sometime during the twentieth century, the artist’s name became a monolith, almost like a corporate logo, and we began to see their work as being synonymous with the person. Michael Rud Jakobsen: This is a tough question, since I tend to believe that we are by everything that surrounds around us, by the people we meet and all the stuff we see, hear and feel. The premise of Wartile came from the ambition to recreate the feeling of playing with miniature figurines as a child, building small landscapes and bring it to life by adding personality, voices and actions to those small figurines. With Wartile we want to build this miniature universe so many remember from their childhood memories, but as a place where we again as adults can go and have fun without the effort of making everything up ourselves. 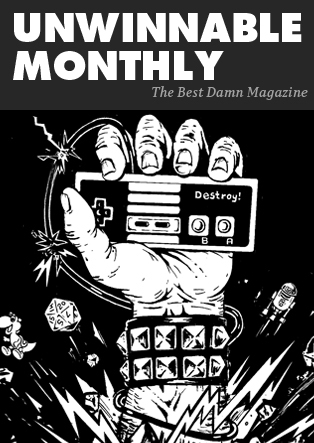 You’ve been reading an excerpt from Unwinnable Monthly Issue 87. To read the article in its entirety, please purchase the issue from the shop or sign up for a subscription to Unwinnable Monthly!